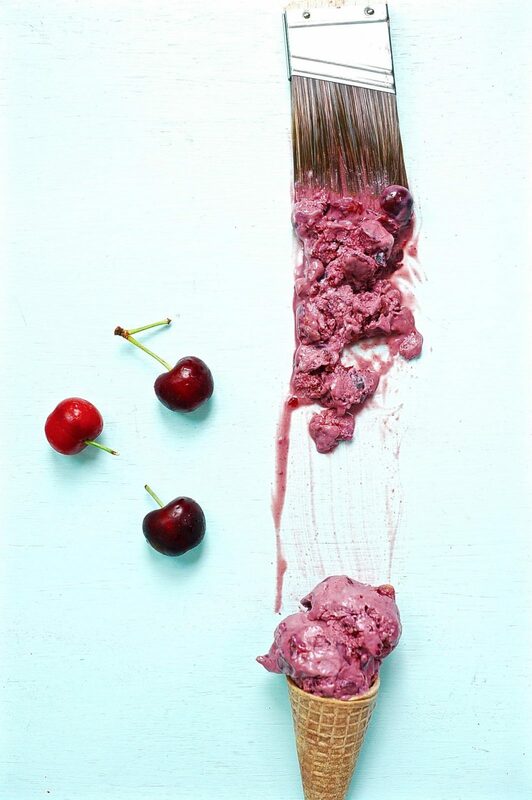 Here are your choices: luscious, deeply flavored cherry ice cream with succulent cherry bits scattered throughout. Or Intense creamy blueberry ice cream with dark chocolate morsels. Argh. As you can see from the photos I chose not to choose. Ha, I beat the system. When you come to a fork in the road. Take it! Today I tried to stick a magnet onto the car. It fell right off. What is the word for that sensation. Let’s invent a word for when you miss a step going downstairs and your stomach flip flops. Lets call it oopsi-daisy. We will add a de- to that word for when the opposite occurs and you assume there is one more step and you make that awkward no-step step at the bottom of a staircase. De-oopsidaisy. One berry, two berry, pick me a Blueberry ! Looking for Berries – Berries for Jam ! Also, since I am on a roll, is there a word for when you pick up something that you think will be light but actually has the gravity of Mars and it doesn’t budge? My Aunt Jette had the opposite sensation when she first met me as a little girl. Years ago I brought my daughter home to Denmark to meet the family. When I introduced my Aunt Jette to my then 14 month old daughter Olivia, she swooped down to scoop her up. She then began to laugh and told me about the time she first picked me up when I was a little girl. Her children were made of sturdy stuff and so when she went to pick me up she put so much force into the gesture that I ended up lifted above her head. Jette had forgotten that moment until she lifted Olivia up and had the same sensation. Hollow, she said, my bones must be hollow like a birds, and I believe she was right. I would love to hear from you about any words you feel are missing from the English lexicon. This no churn ice cream comes together in under 20 minutes. Toss it in the fridge and go play tennis. Why did I write that? I have never played tennis. Anyway dessert awaits you in a few short hours. Soak your cashew in water for at least 8 hours. If you have never soaked cashews before you will think they have gone off because they get a bloated water logged appearance. All is well. Continue. Place your eventual ice cream container into the freezer to get it nice and chilled. I use a metal bread pan. 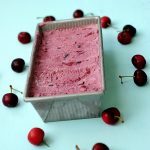 In a food processor or blender puree the cashews, coconut oil, lemon juice, salt, banana and the 1 cup of cherries or blueberries until smooth. You want is totally smooth. I run it between my fingertips and if I feel grit from the cashews, then I process some more. 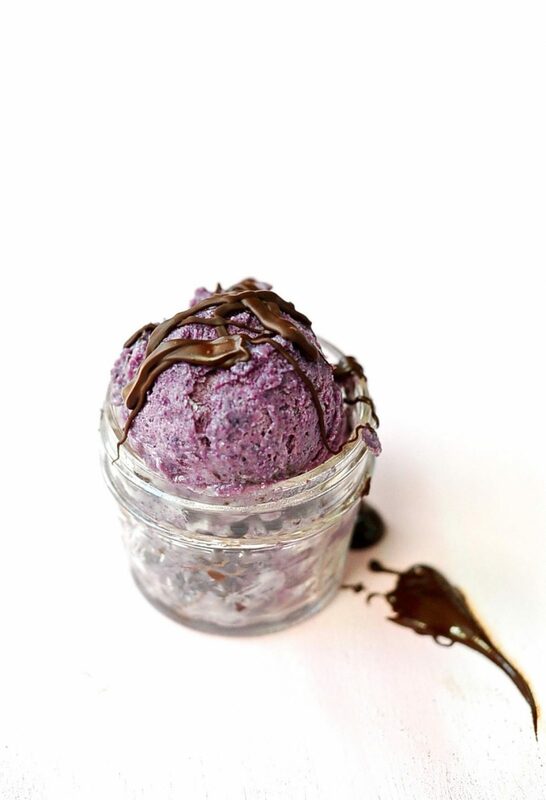 Place the berry/cashew puree into the freezer or refrigerator until your aquafaba is ready. Place the cool aquafaba and cream of tartar into the spotlessly clean bowl of a stand mixer fitted with a balloon whisk attachment and whip on high until stiff peaks form. This will take anywhere from 5 -10 minutes. Add the vanilla extract and whip another minute. Slowly add the sugar 1 tbsp at a time to the whipping bowl. Whip at least 30 seconds between additions. Into your bowl of whipped aquafaba very gently fold in the blueberry/cashew or cherry/cashew mixture. 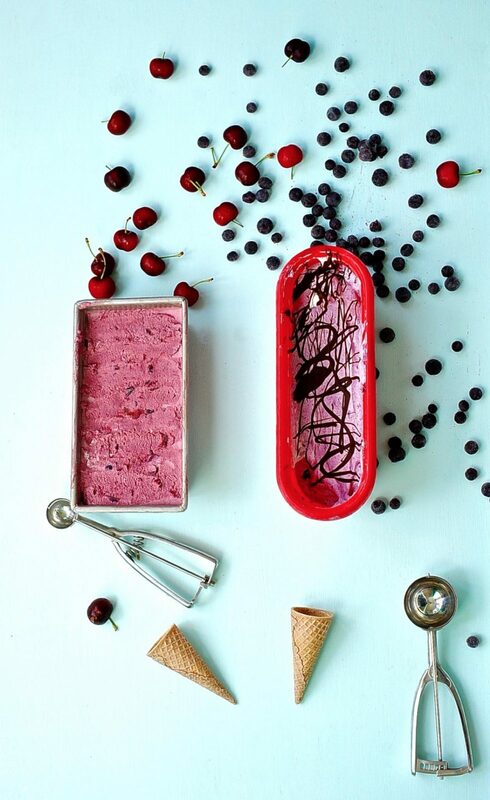 If you are making the cherry ice cream now is the time to fold in 1/2 cup chopped cherries. If you are making the blueberry fold in the chips now. Scoop the mixture into your chilled container, cover, and place in freezer. Wait about 6-8 hours. I've been known to eat it sooner and it is like a semi-freddo and quite delicious. This looks delicious, thank you so much for sharing. I will print it off, and try it out as soon as I can get some garbanzos cooked! Yay that is great. Tag me in Facebook or Instagram with a photo if you want. I’d love to see. Sitting in a lounge in Istanbul, drooling, Johanne! Oh Radhika,I’m glad I could help the time pass. Safe journeys,as airports go that is one of my favorites. A few more of these and I’ll convert to vegan life. Wow! 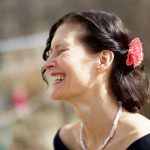 My mouth waters and my artists’ soul embraces your photos with joy. I had a great frolicing photographing the ice creams. They make great models like Russians, all frosty and then they melt. Love you! If you add an oil based extract to aquafaba whilst whipping it will deflate….but you could add the oil based vanilla to the cashew/ berry base and then fold the whole thing in once the Aquafaba is whipped. Also on this recipe it does not add a huge amount of flavor and you can safely skip it all together. Yay! You are making it. I am so glad. Wow, what a lovely compliment! Thank you. My favorites were Black raspberry and peppermint. But really they were all creamy and delicious. I think the walk there made the ice creams taste even better. We do have an ice cream maker but I rarely drag it out. 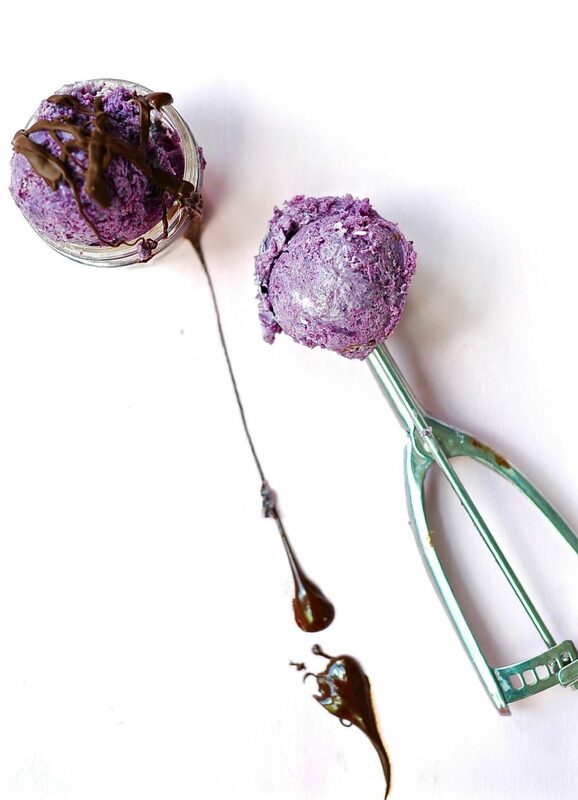 I have been making no-churn ice creams like these for a few years and am really happy with the results. Texture is everything. You write about defrosting your ice cream for just the right amount of time and I do the opposite. In Winter when I want to have chocolate after dinner I sometimes sit on a bar of chocolate through dinner to warm it up. Oh I would recommend a good freezer container to store said ice cream though. A well insulated freezer container really preserves texture.I am working on a list of kitchen appliances, utensils and basic pantry items to refer people to when they want to know what I use, and what has stood the test of time in my kitchen. Hopefully I will get that up and running this week end. I am pretty slammed time wise. Oh cool. I never thought of an insulated freezer container. Looking forward to that kitchen gear basics list whenever you get around to it. When my mother-in-law comes to visit bless her heart she always recommends this or that gadget while we’re throwing dinner together. It goes like this: “Oh, what you guys really need is a —.” Fill in the blank. And I say, “NNNOOOO! I can easily do that with a plastic bag/knife/fork/whisk/bottle/hammer/chainsaw/whatever. No problem. For the love of sweet little baby Jesus please don’t buy me that gadget because I know that you’re thinking of doing that. There is absolutely no room at the inn.” I know. I’m a bad daughter-in-law. What pretty pictures!! How do I make aqiafaba from dried chickpeas. Also can the same recipe be used with any other fruit combo other than what you have mentioned. Thank you! Hi! Thank you for visiting. 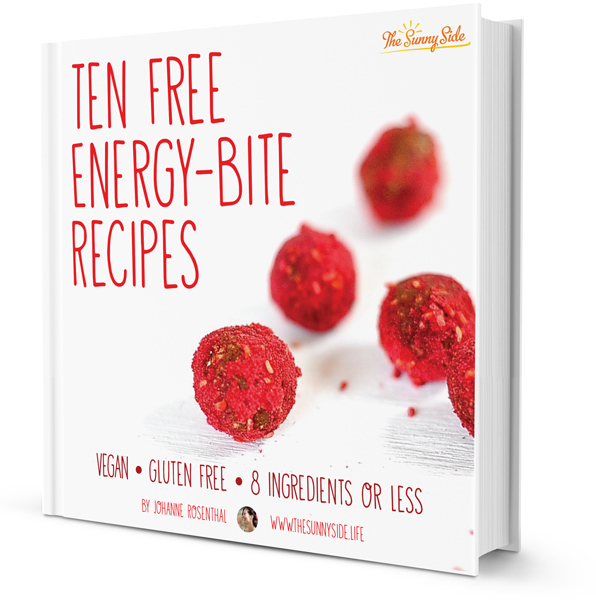 Firstly I have used many fruits and fruit combos with this recipe and they all worked out. Fresh or frozen are both good as well. I have used mango, strawberry, cherry, blueberry, blackberry and plum. There is no need to presoak as we were all advised to do in the past. Simply cover your dry chickpeas (I buy it in 1 lb bags) and cook at a slow boil until they are soft. If the water runs low keep adding to cover chick peas. I don’t use salt when cooking them because I usually use the aquafaba in sweet applications. The old wives tale was that salt inhibits cooking time of legumes but that is actually not true: age of the bean does affect cooking time though. The fresher your chick peas the faster they will cook. Count on anywhere between 1 1/2 hours to 2 1/2 hour till they are soft. If you let the chick peas cool in the cooking liquid over night you will get a thicker aquafaba. If you need the liquid right away then strain it off and reduce it on the stove or in the microwave if needed. 4 cups of dry chick peas should yield you about 3 cups of aquafaba. Cool before using. Ooh lovely, I have mulberries in my freezer and will definitely be making this with them. Oh my mulberries, how dark and juicy. I can’t wait to hear how it turns out.